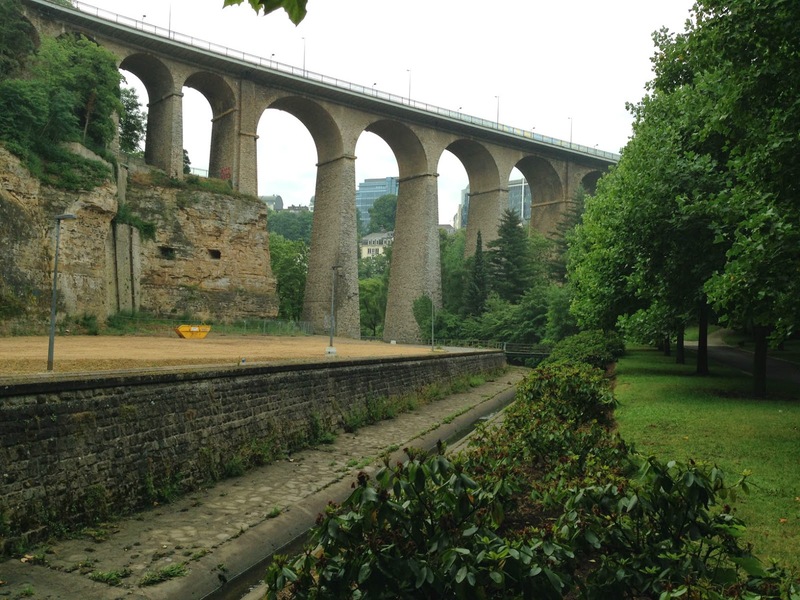 Luxemburg City (also spelled Luxembourg, or Lëtzebuerg in the local dialect) has one of the most unique and dramatic locations in the world: throning on the cliffs above the serpentine Alzette River gorge below, with arched viaducts connecting it to the other sides. It was once one of the most heavily fortified places on earth, called the "Gibraltar of the North," with the fortifications gradually extended by Spanish, Austrian, French and Prussian occupiers. The cliff faces are still holed with openings for canons, connected by a maze of tunnels. The panoramas from above are breathtaking, and the views from below are equally impressive. This route tries to capture some of that visual drama, from above and below. It follows the old city walls, by either running along the ramparts themselves or through a park where a section of walls used to be, or running along the foot of other walls, as they go over the river at different spots. The town itself is a pleasant, wealthy place that comes across as a prosperous regional market town rather than as a capital city. 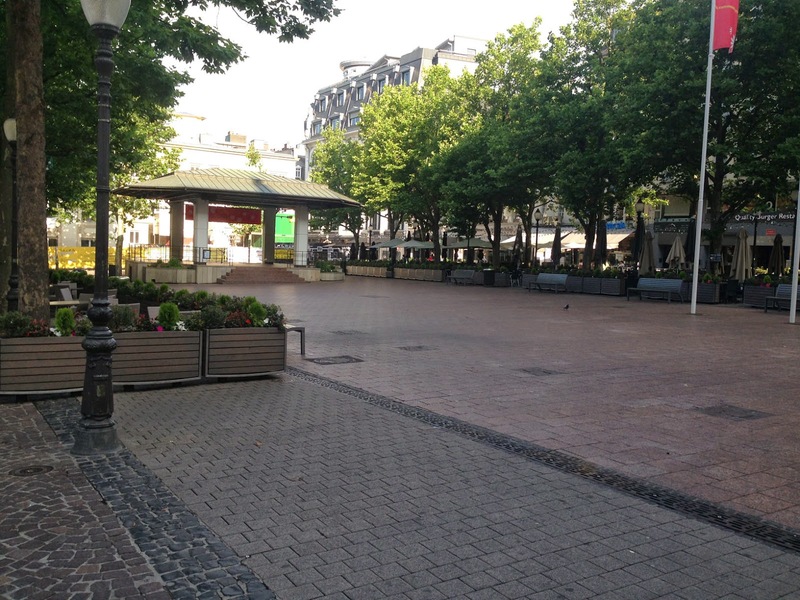 The main square, Place d'Armes, is a nice, leafy public square centered around a bandstand, with lots of shade-trees, and filled with restaurant tables and relaxed customers during good weather. Luxemburg is a place with an identity problem, because the country is basically German-speaking (the other -- French-speaking -- half of Luxemburg was swallowed by Belgium long ago, a place with its own identity problems), but the public life in the city and all the street signs are in French. We'll start the run in the heart of town, at the Grand-Duke's palace, on Rue du Marche-aux-Herbes. 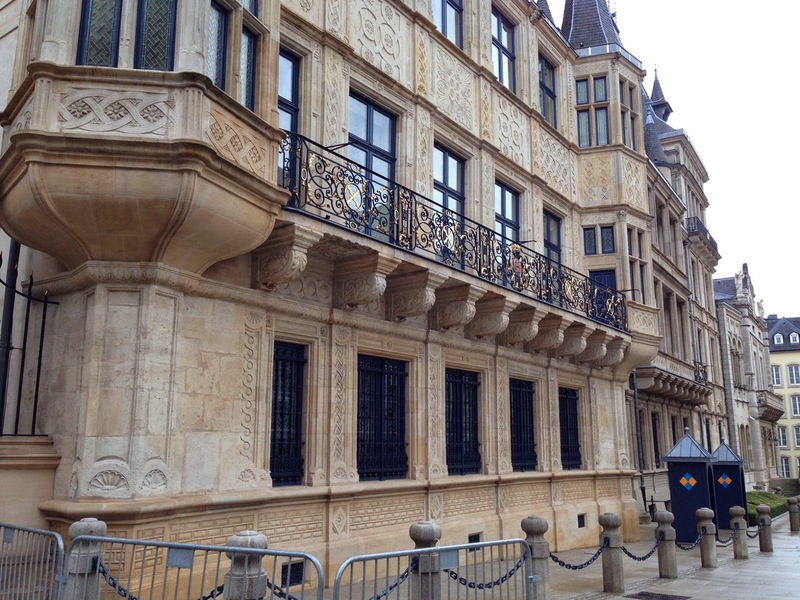 Luxemburg is the last grand-dutchy surviving in Europe. The reason it exists as a separate country is mainly because France and Germany both wanted it, and didn't want the other to have it (it's such a great spot for a fort, after all). So they agreed to let it be a separate country, out of the control of each of them. And after fortified castles lost their military importance, everyone just sort of forgot all about it. Standing there at the palace, turn west to run directly into the town's biggest (but not very charming) square, Place Guillaume II, with its statue of the mounted Guillaume. The town hall is on the left and the cathedral is further off behind it, tucked-in among various small government ministry buildings. The nearby Ministry of Agriculture building barely has room to park a tractor. Run diagonally towards the right, through the square, and exit via the arched walkway. You'll come out to the next square, the Place d'Armes, with its bandstand. Also run diagonally towards the right here, and then turn right on the next cross-street, Rue Philippe II. Now just run down this pleasant shopping street for four blocks until you come to the Luxemburg town park, Parc de la Ville, on the left side. Turn in there, to the left. 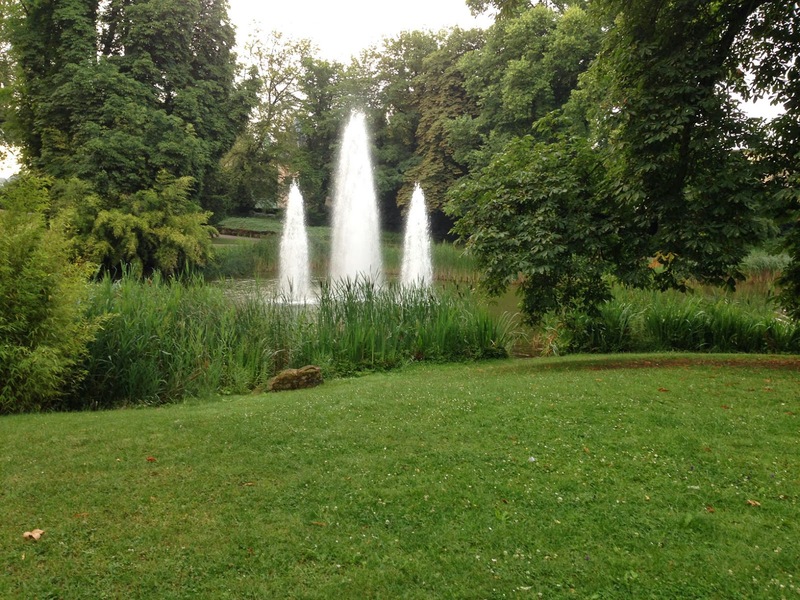 This park was once the outer earthen defensive walls of the fort. It curves towards the south, as you pass all those normal, wonderful things that make up a nice public park: flower beds, benches, pigeons, a great playground, a couple of museums and a pond with fountain. You'll cross two cross-streets that bisect the park, and pass the museums. When you get to the south end of the park, you also reach the south end of the plateau upon which the town sits. 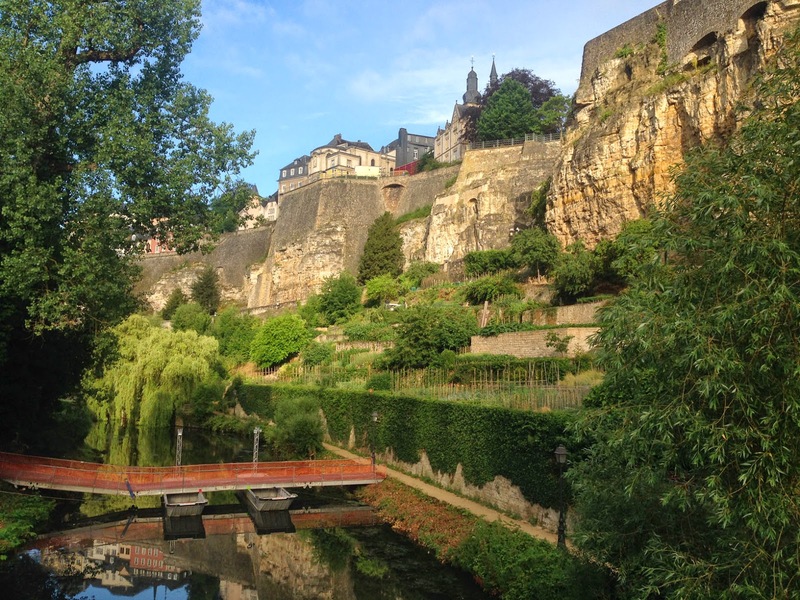 You are right next to one of the main car bridges, Pont Adolphe, a breathtaking arched viaduct that connects to the cliffs on the other side of the Valée de la Pétrusse. Actually, there are two bridges here: the new, ugly, blue bridge is just temporary, I think. At least all the construction activity around it gives me that impression. Now cross the street from the park, Avenue Marie-Thérese, and take the winding footpath that serpentines down below the blue bridge: we're headed to the valley floor! Continue following the serpentines of Rue de las Semois as far to the right side as possible, taking the path that goes towards the bottom of the valley. There is construction work as I write this, as I mentioned, and some parts of the path are used by the construction team, but they have provided boardwalks for pedestrians to get around it all. Normally, you can take one of either trail lining each side of the stream at the bottom, heading east. You'll run under a second viaduct bridge. 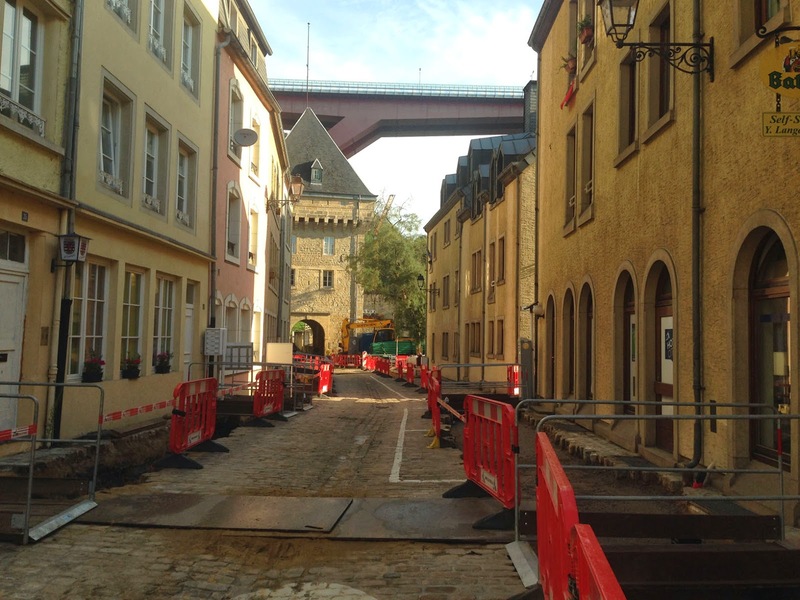 At the bottom, the trail connects into the lightly used car street, Rue St. Ulric, which turns to the left to go through the lower town, called Grund. 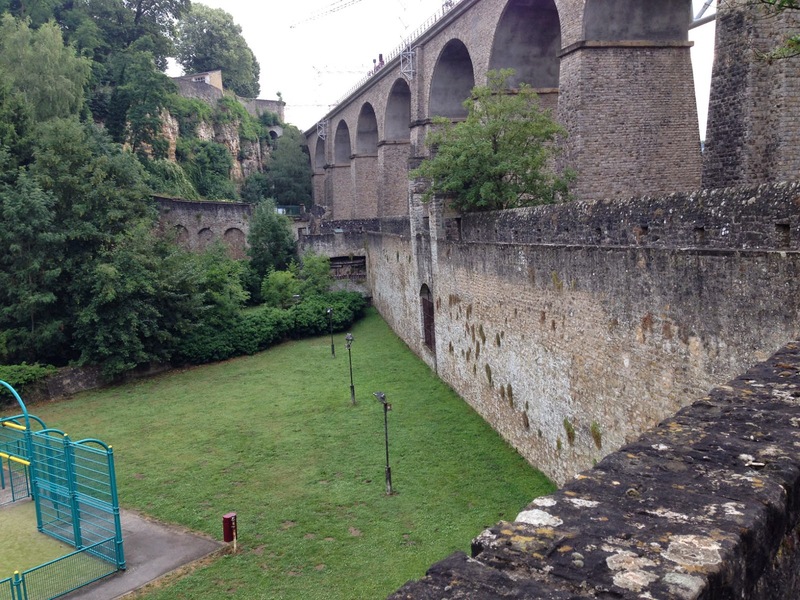 But this running route will keep going straight at this point: take the path that leads up onto the ramparts next to the third arched viaduct bridge ahead on the right. The trail now runs atop the walls over the river and then leads to some steps up to the plateau on the far side, called Rham. Now follow the path to the left, with the ravine down below your left side as it curves around the small plateau. The buildings on your right formed an old barracks for the former fort garrisons. Now they have been nicely restored around a green square, but the security guards are eager to tell errant joggers that they aren't welcome there, so just stick to the path around the perimeter. Leave the barracks area by running out through the gate-tower at the northeast corner of the neighborhood, and turn left to follow the street downhill towards the river again, the Rue de Treves. But don't follow the serpentines: at the first curve, continue straight through the next gate in through the fort walls and immediately turn right and take the steps down to the next ramparts that cross the river. You are now running towards the castle area, which sits on the cliffs right in front of you. 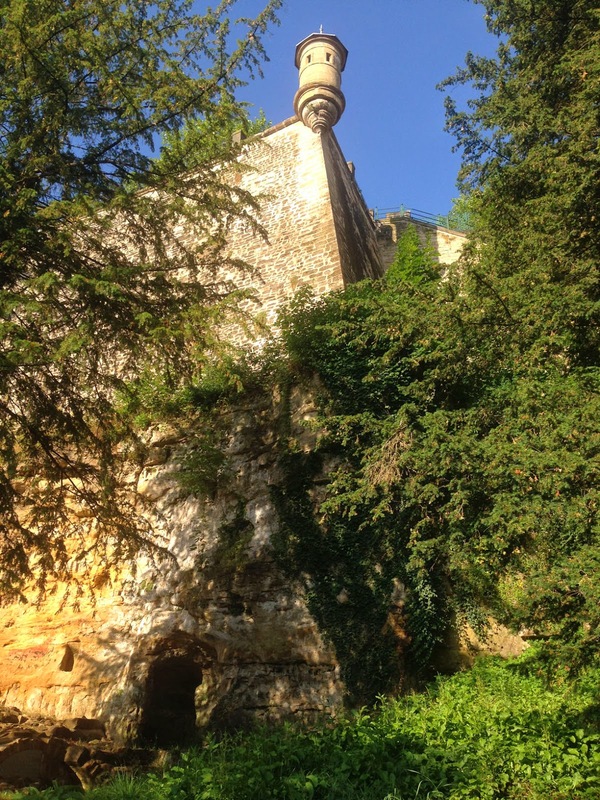 The big holes in the cliffs are called the Bock Casemates, all connected with tunnels to the castle above. 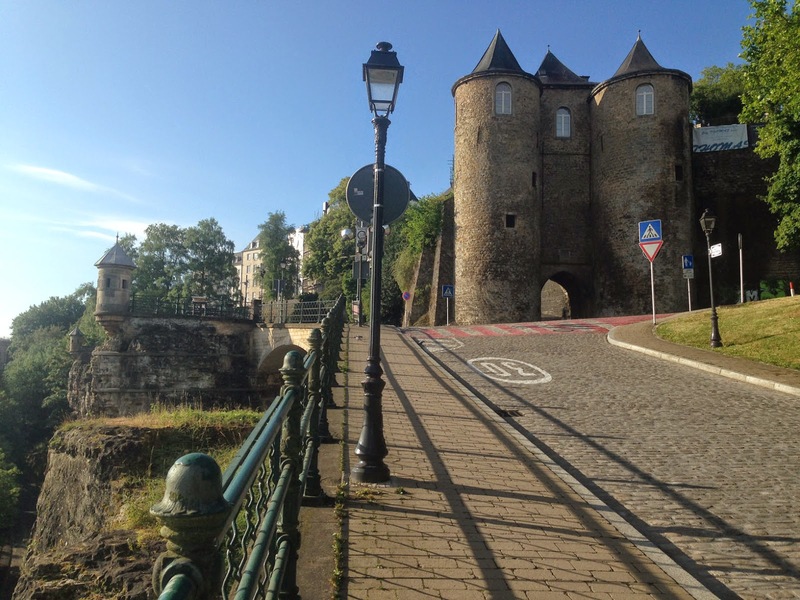 When you cross the river, turn left onto the narrow cliff-side path and run below the castle until the bridge connecting the town to the castle appears on your right. This red-sandstone bridge replaced an older drawbridge a few hundred years ago. Turn right and run below the bridge and now follow the trail as it heads downhill below the cliffs on your left. The town center is above you as you run northwards downhill along Rue Weis. You will soon come to the next lower town, Pfaffenthal. Run between the houses on narrow Rue Laurent Ménager until you come to the gate-tower on the far- (north) side of the lower town. You'll see a giant modern car bridge crossing the valley above, just past the gate tower. The bridge connects the town center on the left side with the European Union buildings on the right side. Now we'll circle back to a spot a block behind us: turn right and take the path crossing the river (called Beim Beinchen -- the little leg) along the walls to the gate tower on the other side. 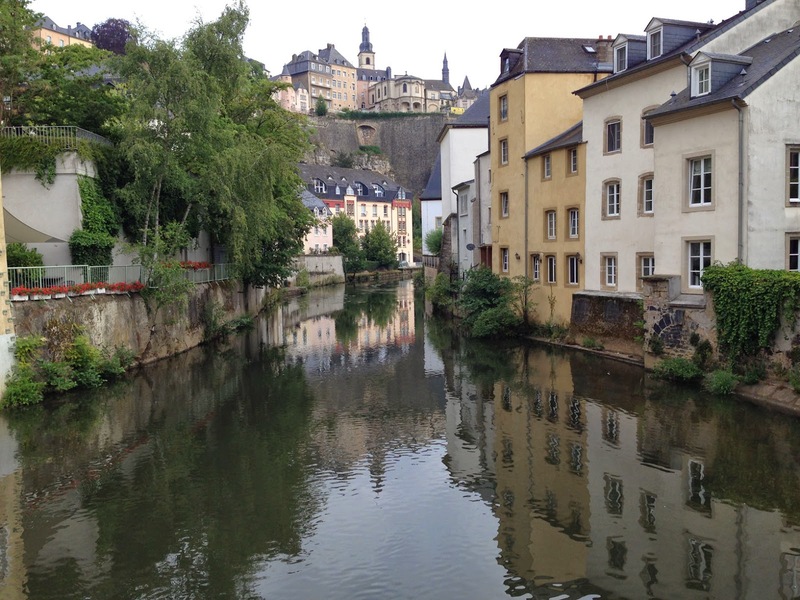 NOTE: The hillside across the river is covered with other fortifications, and if you follow the roads up there to the top of the Kirchberg, you'll be in the modern quarter full of European Union buildings. Here you turn right and run back south the one block to the church and then cross the bridge there, on Rue du Pont. You are now back at the same street in Pfaffenthal, Rue Laurent Ménager, where you were just a couple of minutes earlier. Turn left and then run southwards out of Pfaffenthal. 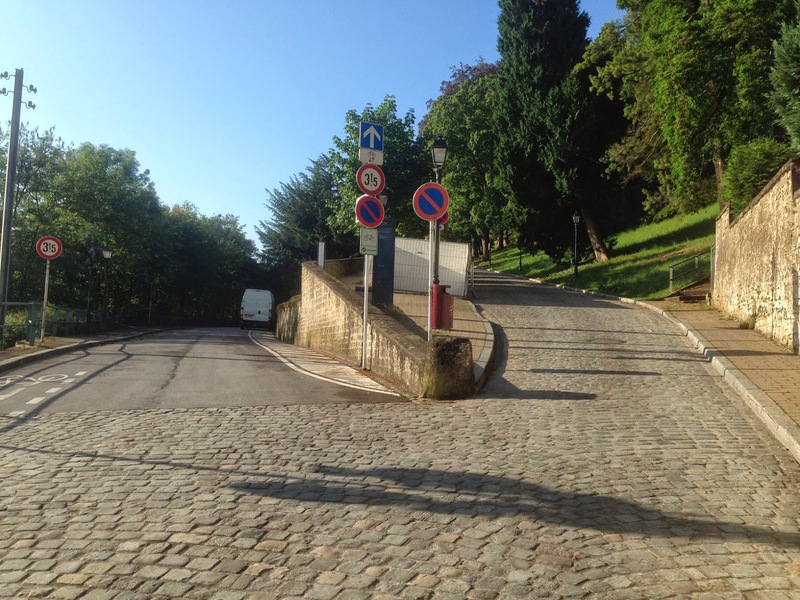 This time, though, when you pass the last house, don't continue along asphalted Rue Weis, but take the cobblestoned street to the right that climbs more steeply back towards the cliffs above, on Rue Montée de Pfaffenthal. This is the hardest bit of the run, with a 60-meter climb. Sorry about that. But it's doable enough. You'll re-enter the city by going through the gate of the Three Towers. Take a good look around you before going through the gate: there's a great view here! 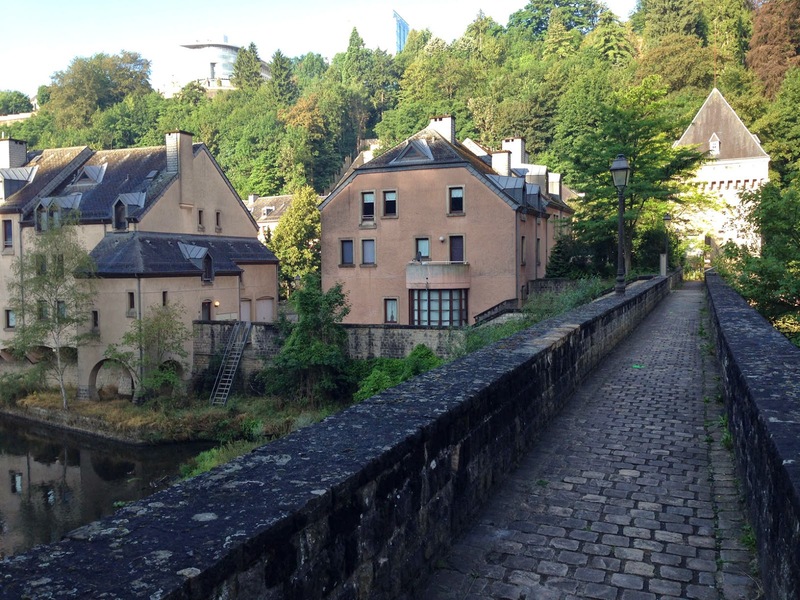 When you run through the Three Towers, take the first real street to the right, Rue Wiltheim, and run two short blocks to Rue de la Boucherie. Then just turn left to end the run at the Grand Duke's place again a block ahead. Hopefully, the duke has put some coffee on, otherwise you'll have to wander back towards the Place d'Armes and pay for one there.